Retirement provides an opportunity to enjoy hobbies and activities you’ve always loved, as well as to try new things. Whether or not you’ve ever considered yourself to be creative, exploring this outlet now can have significant benefits for overall health and well-being. Here are some types of art projects to consider trying, as well as some of the advantages to art and art therapy. It turns out that tuning into your creative side can have benefits beyond filling your leisure time. Studies show that arts and crafts can improve focus and concentration and have positive effects on cognition and memory. Art therapy is also thought to reduce pain for conditions like arthritis. Emotional stress may often be reduced through creative activities such as painting, drawing, printmaking, poetry, or photography. Easing the emotional stress may also result in a reduction in pain. Additionally, many of these activities will increase blood flow to hands, fingers, and wrists, and will also help with hand-eye coordination and fine motor skills. Many people find participating in artistic projects to be relaxing and soothing, and the process of creating something beautiful can boost self esteem and provide you with a greater sense of control. 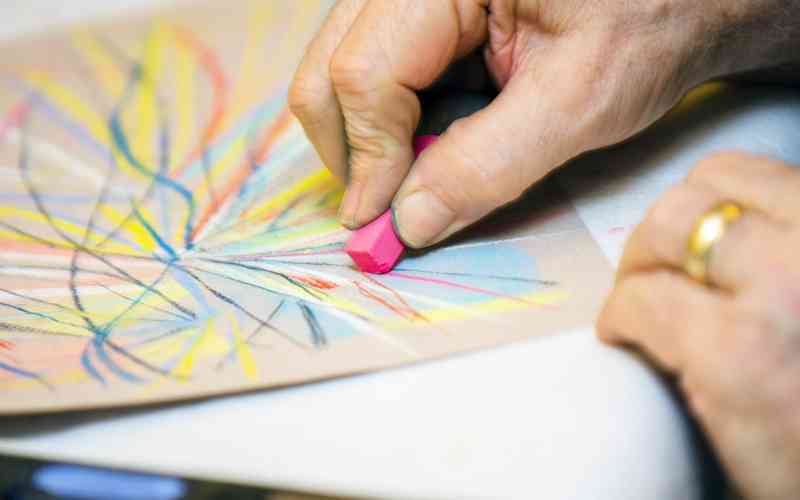 Older adults who regularly engage in creative activities have been shown to have a significantly reduced rate of stress and anxiety, two factors that are often risk factors for chronic illnesses. Participation in art activities has also been shown to correlate with reduced levels of depression. Art gives people an opportunity to express themselves and can also provide an outlet to share feelings or thoughts or even communicate a message. Studies have shown that visual and performing arts, such as painting or dancing, can be a vehicle to reach those living with Alzheimer’s Disease, even when other forms of communication like speaking and writing are not longer possible. Group art classes provide an opportunity to get the “creative juices flowing” in a fun, social setting, to make new friends, and to acquire new skills. Many participants find special connections with fellow art students as well as the instructors. The group setting can also provide a little inspiration and encouragement that is welcomed by artists of all abilities and levels of experience. Art can promote a sense of purpose for seniors who are struggling with isolation or feelings of depression. An art project provides a goal to work toward, an opportunity to communicate a message or make a statement, and also the joy and satisfaction of creating something of beauty. Art can also offer a sense of accomplishment and pride as projects are shared with others. Local colleges, community centers, and senior living communities are all good places to look for an inspiring class. As an example, The Maples of Towson offers a variety of weekly art workshops, such as Art Therapy, Jewels and Beads, and Art with Cynthia. To learn more about these offerings, contact The Maples of Towson today to schedule a tour. Starting an individual art project or collaborating with a friend can be a fun way to try something new.